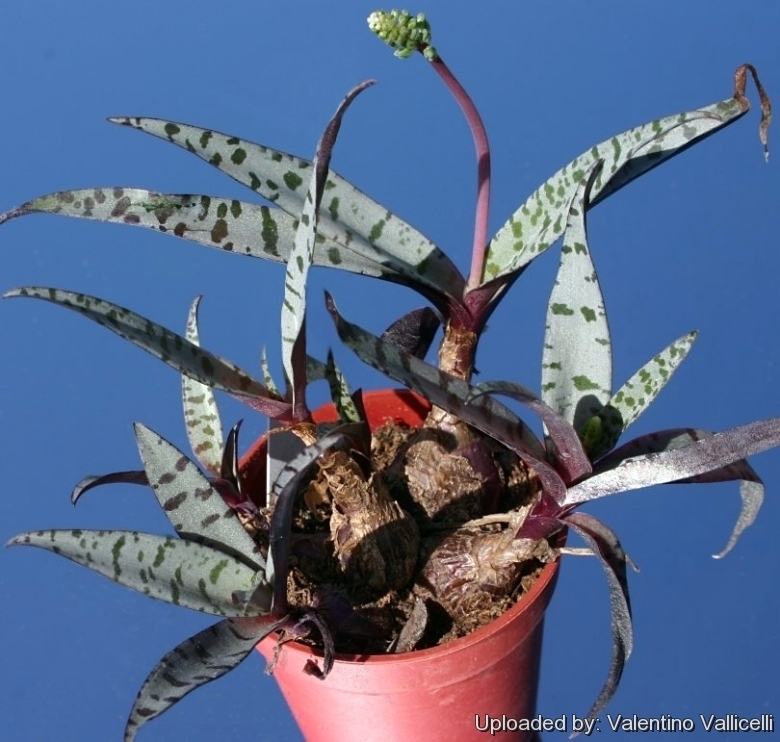 (Silver Squill) The foliage is the beauty of this plant. The single spike of flowers is not spectacular, but if allowed to become a many-headed specimen, the blooms can be quite impressive en mass. Flowers are very interesting if magnified. Origin and Habitat: It is native to South Africa. Habitat: Grows in arid savanna in summer-rainfall regions, this species has mottled leaves enabling it to blend into its thicket backdrop. Scilla pauciflora Link ex Schult.f. 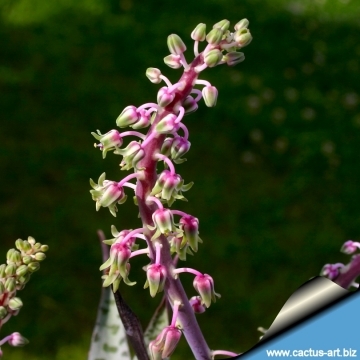 Description: The silver squill (Ledebouria socialis) is a geophytic, evergreen bulbous member of the lily family that forms small, somewhat teardrop-shaped bulbs that sit on top of the soil in thick clusters. It comprises several questionable varieties and its taxonomic history has undergone several changes. Ledebouria violacea, formerly known as Scilla violacea , is one of the forms of Ledebouria socialis which is a widespread and morphologically variable taxon. The upper surfaces of this small lily's foliage are flecked with dark green against a ground of silvery gray-green and the undersurfaces of the leaves are violet (hence the specific name), but most botanist agree on the fact that all the varieties described until now should all be included in the Ledebouria socialis. Flowers appear most heavily in spring and summer. Scilla violacea belongs to a group of very easily cultivated plants, decorative with pleasing appearance of leaves and flower alike. It survives drought as effectively as any succulent. The small, green and purple flowers are borne in short, nodding racemes. Bulb: Above-ground, conical, tapering , green to purple, clothed in peeling, papery tunics that prevent water loss, (15-)20-35(-40) cm tall 8-20 mm in diameter, it will soon cluster from the base to form dense mounds. Roots: Succulent, 1 mm in diameter. Leaves: 2 – 4, lance-shaped, strap-like, 4-7(-15) cm long and 1-2 cm wide, upright to spreading, fleshy, light silvery green, and basal with dark-green, turquoise, olive or aquamarine markings above and wine-red to purple beneath. Flowers: Forms spreading-ascending racemes 9 - 17 cm long of bell-shaped flowers. Pedicels 6 mm long, bracts small, ovate. The flowers are tiny (about 3 mm) but showy, , campanulate, greenish purple-pink with a small pink stripe running down each petal, can be up to 20+ flowers on each spike. Filaments purple, exserted. Ovary globose, stipitate. Ledebouria socialis (Baker) Jessop: forms small, teardrop-shaped aboveground bulbs. Leaves silvery white, shield-shaped with dark green dots. Flowers Small, green and purple in short, nodding racemes. Distribution: KwaZulu-Natal and Eastern Cape, South Africa. Ledebouria violacea (Hutch.) 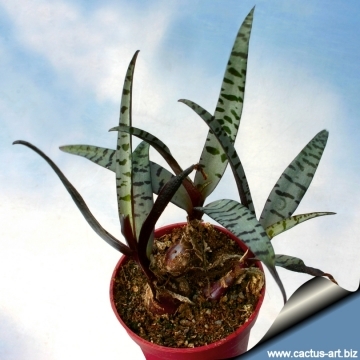 Tjaden: foliage is silvery gray-green flecked with dark green and the undersurfaces of the leaves are violet (hence the specific name), but most botanist agree that it should all be included in the Ledebouria socialis. Scilla pauciflora Link ex Schult.f. : is a horticultural name for a plant that is likely a Ledebouria socilais. The name has not been published, but this plant is often available on the trade. 1) Arnold, T. H. & B. C. De Wet, eds. "Plants of southern Africa: names and distribution." Mem. Bot. Surv. S. Africa no. 62. 1993. 2) Huxley, A., ed. "The new Royal Horticultural Society dictionary of gardening." 1992. 3) Zachos, E. "Tempting Tropicals: 175 Irresistible Indoor Plants." Portland, Oregon: Timber Press. 2005. 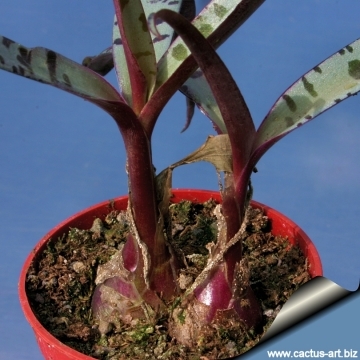 Cultivation and Propagation: Ledebouria violacea (= Ledebouria socialis ) is an easy-to-care plant. Bulbs at the base of the plant must be above the soil. The horticultural usefulness of Ledebouria socialis lies in the fact that it thrives in rich compost in shade and semi-shade, where many other plants will flounder. 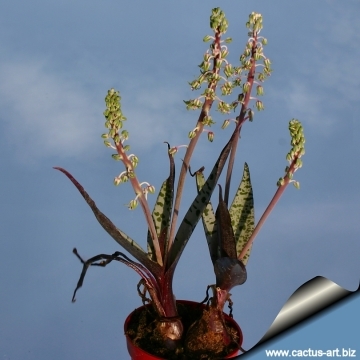 It is an excellent plant for the classroom or terrarium; flowers freely. Soil: It prefers a well-drained but rich soil mix. Exposure: It needs full sun to semi-shade, but adapts to shade too. Waterings: Let it dry completely between waterings. Hardiness: Hardy down to freezing so best kept in a frost free place indoors and can be grown outside where there is no danger of frost. It is very happy sitting in window sill too.